This gem of a haveli is located inside the fort, overlooking the fort entrance and the town. 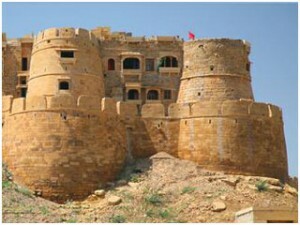 The rooms are actually a part of the almost 1,000-year-old fort wall and evoke a sense of medieval Rajasthan. The contemporary interiors are in direct contrast with the ancient surroundings, and the rooftop terrace a perfect place to lounge and take in the amazing views. Rooms are tastefully appointed with beautiful hand-carved wood furniture and decorated with local hand-crafted art work. The over-sized beds are extremely comfortable. Modern bathrooms with strong water pressure (hot & cold) are a rarity in India’s guesthouses. Air-conditioned rooms are guaranteed to keep you cool and comfortable even during the occasional citywide power outages due the houses efficient backup generator. The cooked to order breakfast that is included in the room rate is always delicious.